Background: Sildenafil citrate may increase endometrial thickness and affect the outcome of frozen-thawed embryo transfer cycles. 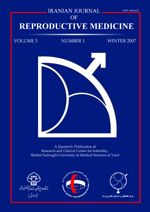 Objective: The aim of this study was to estimate the effect of sildenafil citrate on ultrasonographic endometrial thickness and pattern and to investigate the estrogen level on the day of progesterone administration, the implantation rate and chemical pregnancy rate in frozen embryo transfer cycles. Materials and Methods: This randomized controlled trial was conducted on 80 patients who had an antecedent of poor endometrial response and frozen embryos. 40 patients were given estradiol by a step up method with menstruation to prepare the endometrium, and the other 40 were given sildenafil citrate tablets (50 mg) daily in addition to the above treatment protocol from the first day of the cycle until the day progesterone was started. This was discontinued 48-72 hours prior to the embryo transfer. Results: The endometrial thickness was significantly higher in the sildenafil citrate group (p<0.0001), the triple line patterns of the endometrium were significantly higher in the sildenafil citrate group (p<0.0001), while the intermediate patterns of the endometrium were not significantly different in the two groups. The echogen patterns of the endometrium were significantly higher in control group (p<0.0001). Finally, implantation rate and the chemical pregnancy rates were higher in the sildenafil citrate group but not significantly. Conclusion: As our study shows, the oral use of sildenafil citrate is a good way to improve the endometrial receptivity. We recommend the routine use of oral sildenafil citrate in patients with a previous failure of assisted reproduction technology cycles due to poor endometrial thickness.